C1118. ARTUR RODZINSKI Cond. NYPO. : Le Sacre du Printemps (1913 Version), Live Performance, 30 Nov., 1946; IGOR STRAVINSKY Cond. 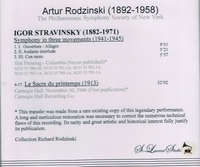 NYPO: Symphony in Three Movements, recorded 28 Jan., 1946 (from Test Pressings) (both Stravinsky). (Canada) St Laurent Studio YSL 78-142, ('Le Sacre' is from Rodzinski collection). Transfers by Yves St Laurent. Transfers by Yves St Laurent. "'Le Sacre' is the complete 1913 original. Actually 'original' is not exactly accurate. Some half dozen years after the premiere Stravinsky was asked to correct the many copyists' errors in the existing originals. As it happened, Stravinsky had some second thoughts and new ideas that he substituted for the original passages. In 1947 he would publish a new revision which would take it out of the Public Domain."